LGA members need a separate USGA TM (Golf Genius) account in order to register for Championships. If you haven’t created a USGA TM account yet, you will need your GHIN number and last name in order to do so. You’ll then have the ability to create a username and password for future use. CLICK HERE for the LGA Championships log in (and sign up) page and to create your USGA TM account. Call the LGA offices at 337-265-3938 if you need assistance registering for a Championship. 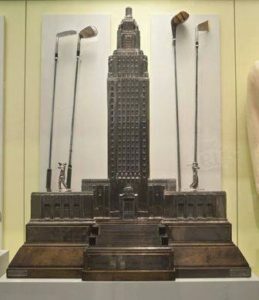 Pictured above is the Louisiana Golf Association State Amateur Championship trophy. This beautiful and historic trophy is now housed in the Louisiana Sports Hall of Fame in Natchitoches, Louisiana. It was commissioned by Huey Long and is comprised entirely of sterling silver.